Misc. 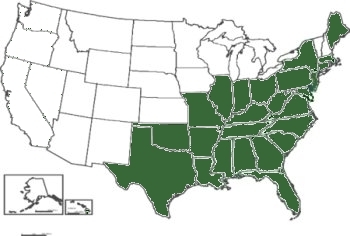 American holly is dioecious (separate male and female plants). 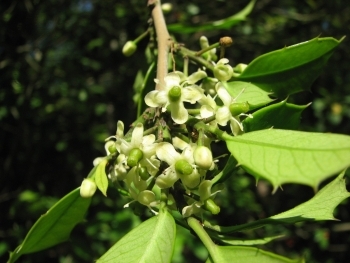 Witmer Stone, 1910, writes "The Holly is especially characteristic of the Coastal strip, and there it is that we find it rising to the full dignity of a tree, with trunk nearly or quite a foot in diameter, and its grayish-white bark gleaming through the masses of shining green leaves. Here, too, it produces berries most abundantly, and trees on protected ground are a gorgeous show during the autumn and winter. The vandalism of the Christmas peddlers...is largely responsible for the dwarfed barren condition of most of the Holly of West Jersey, but the importation of vast quantities of Holly and Mistletoe from the south to Philadelphia has largely done away with this, as it is easier for venders to secure a supply from the wholesalers on the river front than to bring their own Holly from New Jersey. On the coast many of the finest trees are cut down every year in effecting so-called improvements incident to the opening or enlarging of a seaside resort, but certain cottagers have carefully preserved the Hollies and enclosed them in their grounds"(539-540). 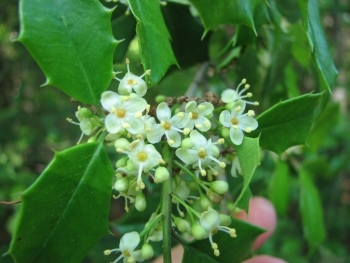 Holly is found in maritime forests and is resistant to salt spray. 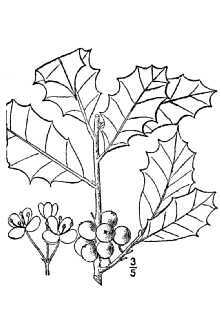 History of the Holly-"Mr. Holly" and the "Holly City" can be found here.